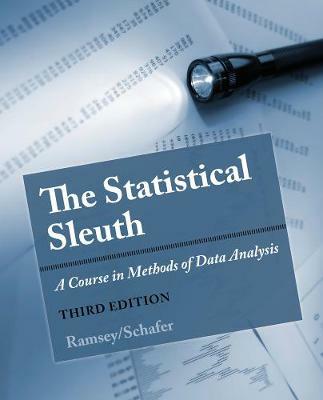 THE STATISTICAL SLEUTH: A COURSE IN METHODS OF DATA ANALYSIS, Third Edition offers an appealing treatment of general statistical methods that takes full advantage of the computer, both as a computational and an analytical tool. The material is independent of any specific software package, and prominently treats modeling and interpretation in a way that goes beyond routine patterns. The book focuses on a serious analysis of real case studies, strategies and tools of modern statistical data analysis, the interplay of statistics and scientific learning, and the communication of results. With interesting examples, real data, and a variety of exercise types (conceptual, computational, and data problems), the authors get readers excited about statistics.